Our online purchasing system is active. You can order online using PayPal or for other payment options contact us at (870) 793-6622 or email us. We do not accept orders outside the continental US. For wholesale orders please contacts us via email. Thank you. In the foothills of the Pindos Mountains, watched over by the monasteries of Meteora, is a small village called Ardani located just outside Trikala in the region of Thessaly. West of the Aegean Sea in the heartland of Greece is a little known agricultural paradise and this is where our family business is located. Upon returning to Greece in the late 1990’s, after studying and working in the United States, we wanted a business that would involve and benefit our entire family. We started working 20 acres of 20 year old olive trees and each year have added to them. Our policy from the beginning has been to keep the earth and our trees clean. We wanted a product trusted enough that our children, our family and our friends, like you, could enjoy. In 2005, we joined BioEllas, the organic farming association, and enjoy chemical free produce. In addition to our olive orchard, we have 5 acres of vineyard that supplies us with organic grapes and homemade wine and tsipouro, which is a distilled alcoholic beverage native to Thessaly, thought to be invented by the monks of Meteora. The region of Thessaly is located in the central section of mainland Greece. It is surrounded by high mountain ranges encircling a low plain. The Pinios River flows through this central plain. The Pinios has several tributaries that originate in a delta configuration that encompasses the entire plain to the south of the main river. The alluvial soils of the Pinios Basin and its tributaries make Thessaly a vital agricultural area. One of the climate characteristics of the Thessaly plain is frequent summer rainstorms. These frequent rains amplify the fertility of the plain, which has led this region to be called the breadbasket of Greece. 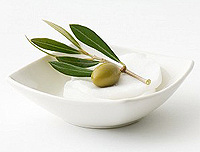 Thessaly Olive Oil comes from the variety of olives called koroneiki. 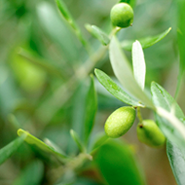 The small koroneiki olive is chiefly grown and famous for its high quality olive oil. The koroneiki, belonging to the family Olea europaea, has been grown in Greece for more than 3,000 years. We also have megaron and amfissa varieties of olives. Special care is taken at harvest time. 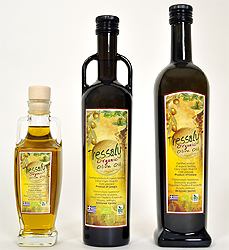 Our olives are hand picked and taken directly to an accredited organic oil mill to be cold pressed and bottled. Chemical analysis has shown it to have very low acidity (0.3%) and to be high in anti-oxidants, which reduces bad cholesterol and increases good cholesterol protecting against heart disease. Holiday labels available for corporate orders. Your company name and choice of holiday message will appear on the label. Email us for more information and for discounted corporate rates!